A series of residential towers is set to replace some of Miami’s historic hotels. The city has seen a wave of development in the last 10 years, and neighborhoods such as North Beach—once off the radar—have become new urban hot pockets. Many long-time residents are concerned about the dangers of luxury condo-fication, and Mayor Philip Levine has voiced concerns about preserving Miami’s iconic architecture. 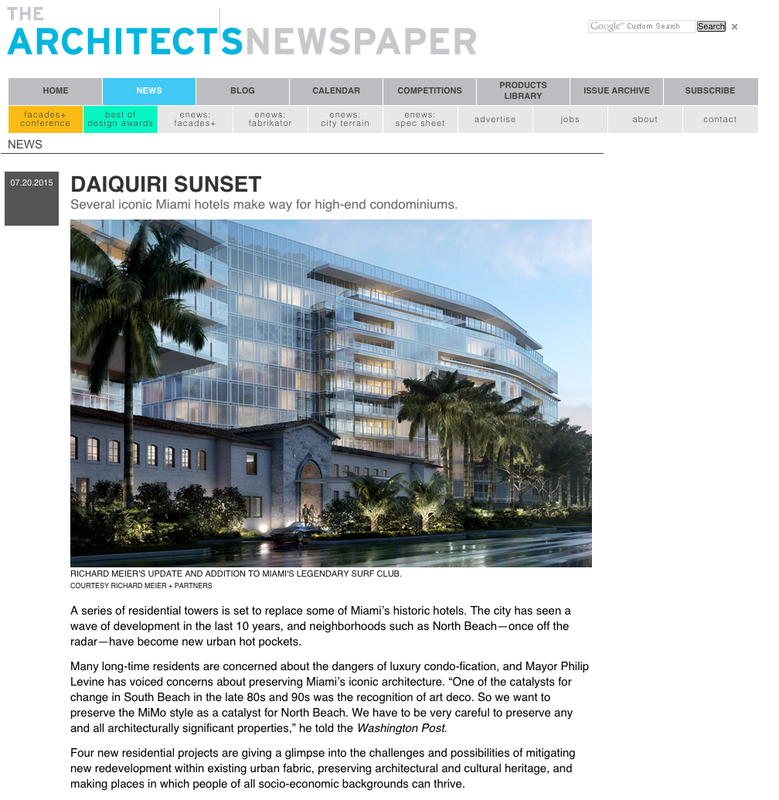 “One of the catalysts for change in South Beach in the late 80s and 90s was the recognition of art deco. So we want to preserve the MiMo style as a catalyst for North Beach. We have to be very careful to preserve any and all architecturally significant properties,” he told the Washington Post. Four new residential projects are giving a glimpse into the challenges and possibilities of mitigating new redevelopment within existing urban fabric, preserving architectural and cultural heritage, and making places in which people of all socio-economic backgrounds can thrive. Similarly, Richard Meier will update the iconic (and ultra-exclusive) Surf Club hotel, converting it to condos. The original 1930 building, a protected Mediterranean villa with a ballroom and bathing cabanas, will be restored with new 12-story residential and hotel towers looming behind it. The site of the old King Cole Hotel will be home to the Ritz Carlton Residences, a midrise waterfront residential project designed by Milanese architect Piero Lissoni. Because the hotel was repurposed as a hospital before closing permanently, a zoning quirk re-categorized the site as low-density residential to match the abutting sites. Thus, had the developers demolished the building, it would have meant rebuilding at a lower height restriction so they are adapting the existing structure. Real estate firm Terra Group asked Renzo Piano to redevelop the site of The Biltmore Terrace Hotel, a Morris Lapidus–designed postwar tower that had recently been a Howard Johnson. There was some controversy when plans to refurbish the building into a new hotel were scrapped abruptly after a height variance was given. However, the building was not landmarked, so a complete demolition began several weeks later. The developer opted instead to master plan the site with a 17-story condo tower and a large park space by landscape architects West 8 that aims to let passersby see the beach from Collins Avenue—a complement to Piano’s subtle architecture. While the contrasts in the projects might tell a story about the importance of historic preservation, they also show a range of strategies for working within physical and legal restrictions to make places that are sensitive to their surroundings and can hopefully be enjoyed by communities while preserving the character of a place. Even if most people cannot afford to live in these ultra-exclusive residences, they still experience them in one way or another, from architectural appreciation to walking dogs in green space.